Another best of list: School Library Journal Best Books 2012. I'm so glad to see Extra Yarn, Penny and Her Doll, Liar & Spy, and Bomb: The Race to Build–and Steal–the World’s Most Dangerous Weapon on the list. And there's lots of nonfiction. Lots of really good nonfiction. Well . . . I left town for a few days, and when I returned, I ran straight into the Thanksgiving holiday which pleasantly gobbled up my time, so I didn't write about as many picture books as I had originally planned this month. Today I'll share a few pictures of the clocks we made this year. I made them for my kids, but they turned out so well that I kept one for my workroom. Sand a pre-cut clock face purchased from your local craft store, then cut a page from a picture book and use a spray adhesive to attach it to the clock face. [Tip: Make sure the spray adhesive goes to the edges of the picture and press the edges firmly to ensure there are no gaps.] Spread a drop cloth or plastic sheet over your work surface and place the clock face up on wooden blocks or some other support so the clock does not touch the drop cloth. [Tip: Be careful not to block the hole in the center of the clock face. A used masking tape ring will work well as a support.] Pour high-gloss EnviroTex Lite over the clock face after stirring the resin and hardener according to the directions. Breathing slowly over the surface immediately after you pour the EnviroTex Lite will help remove bubbles from the surface. Place a large plastic container over your clock to let it dry without getting dust on the surface. After the clock is dry, sand the drips from the back of the clock, insert a clockwork and hands from your local craft store. Voila! We are seeing more "best of" lists as the year comes to an end, and I love it! It gives me a chance to cheer for my favorites and check out books I missed throughout the year. 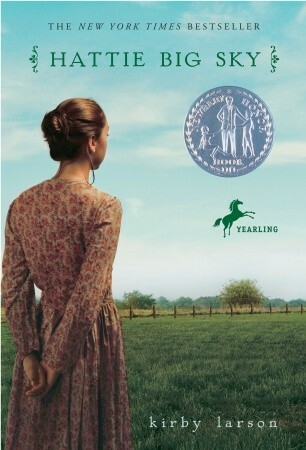 Kirkus published their Best Children's Books of 2012. Check it out--cheer, wonder, and read. This book took me a while to get around to reading, but once I started reading it, all of my homework was pushed aside so I could finish it. I read it in two days. So, ok. You could say it was good. Mo--a soon-to-be sixth grader--has an abnormal upbringing. But, Dale, her best friend is having some trouble himself. They decide to open a detective company, but before long, they get caught up in some mysteries that they weren't expecting to have to solve. First, I loved the characters. They were so unlike anything that I had ever imagined--while they were still believable. Second, I loved the mystery. I am not a huge fan of mysteries, and when it comes to scary, I melt. But this book caught just enough mystery and scariness for me to be captivated, without giving me nightmares. Lastly, I loved the very realistic situations and the way the characters reacted to them. The characters acted their age the entire book. As an almost-sixth-grader, Mo thinks that she knows everything. Who she wants to marry, and what she wants to do. Overall, this book was great! I couldn't come up with anything bad about it--except for the cover maybe--but other than that, it was a great book. 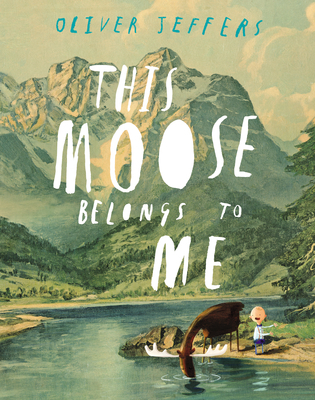 Today I read This Moose Belongs to Me--a funny and thoughtful book by Oliver Jeffers. (But then isn't that what we expect of Oliver Jeffers?) When a moose comes to him, Wilfred knows that the moose belongs to him. So, Wilfred names him and follows him around reading him "the rules of how to be a good pet" which the moose follows (like "not making too much noise while Wilfred plays his record collection") except when he doesn't. But does Wilfred really own the moose? 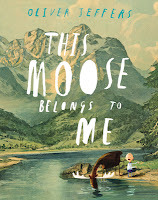 When the moose doesn't respond to his name, Wilfred becomes angry, but after an accident with some string, the moose "perform[s] rule 73 brilliantly," all is forgiven, and the two reach a happy compromise. The cartoon illustrations juxtaposed against painted backdrops create unusual and delightful scenes. And I love the texture on the moose. According to the copyright page, "The art for this book was made from a mishmash of oil painting onto old linotype and painted landscapes, and a bit of technical wizardry thrown in the mix here and there." Visit Oliver Jeffer's website to see more pictures of Wilfred and said moose. You know how it is when you have loved a picture book and find yourself needing a new copy of the book, and you try to buy one, but you can't because the book is no longer in print? Sad, sad, sad. That is how I felt when I tried to get a new copy of Milo's Hat Trick a couple of weeks ago. Milo's Hat Trick is a sure-fire read-aloud hit. 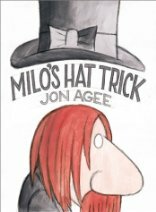 Milo is a terrible magician with a pathetic hat trick. When the theater manager threatens to fire him, Milo needs to find a way to fix his act -- fast. The story is full of surprises, including a talking bear who can jump in and out of hats. The bear's explanation of how he accomplishes that, together with the illustration of him jumping into the hat are hilarious. The exaggerated pictures support the exaggerated story, especially the final picture that shows Milos' new act without unnecessary explanation. Now the big question is why, oh why, is it out of print? After a weekend of knitting socks and hats while watching the snow fall outside, I had to read The Extra Yarn today. 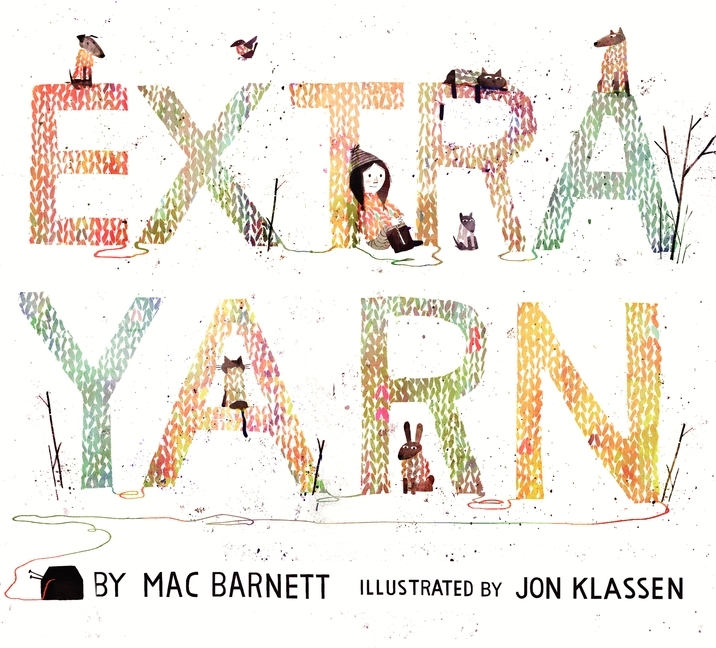 Written by Mac Barnett and illustrated by Jon Klassen, this book has a text and illustrations that work seamlessly together for one of the best picture's this year. Annabelle finds a box filled with colorful yarn and knits herself a sweater. With the yarn she has leftover, she knits a sweater for her dog. "But there was still extra yarn." So Annabelle knits sweaters for her neighbors, her parents, her friends, and her teacher. When the yarn doesn't run out, she dresses up her dreary town by knitting sweaters for houses and trucks. Of course, this special box of yarn draws attention from around the world, and soon an evil archduke who is determined to get the box for himself creates a problem for Annabelle. 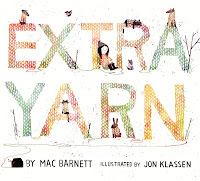 Extra Yarn is fun to read to kids who join in repeating "extra yarn" once they catch on to the magic of the box. Annabelle's spunky voice is consistently cheerful--a perfect fit for someone who is brightening her town. When at the story's resolution, the pictures tell the story, the spare text allows readers' imaginations to fill in the details. I love it when a story doesn't say too much! You can read more about how the author and illustrator worked together and how Jon Klassen made the pictures here. And if you haven't seen it yet, take a look inside. I have always considered myself to be pretty independent. I had a job at 16, worked my way through college and lived on my own. I can put things together and will even unclog a sink or hang a light fixture if the need arises. Overall, I am pretty confident I can tackle most problems that may come up - but after reading Hattie Big Sky, my confidence was put in check. Hattie Big Sky was inspired by the author’s great-grandmother, who independently ran a Montana homestead as a young woman. Knowing the story was based on true experiences makes this book even more inspirational and fun to read. Hattie was orphaned “before [she’d] lost [her] baby teeth” and was passed around between poor relatives until Aunt Ivy and Uncle Holt (a distant cousin) took her in when she was 13. Aunt Ivy was not a loving influence and delighted in telling Hattie that she had “nothing and no one” and that she should “count [her] blessings.” Luckily, Hattie had a sometimes ally in her reserved Uncle Holt, and just when Aunt Ivy was ready to send her to work at a boardinghouse, he produced a letter. The letter was from her recently deceased Uncle Chester, who had a 320-acre claim staked in Montana and has left it to her. If she is able to meet the remaining requirements, the land would be hers. So, as a 16-year old girl, she sets off to Montana where she finds a rundown house, (“Aunt Ivy’s chicken’s had better accommodations”), an ornery milk cow, an old horse, and a lot of work. To top it all off, there is unrest everywhere because of the war and she finds herself caught between perceived loyalty to her country and loyalty to her new friends. Hattie is spunky and her letters to Uncle Holt and to her best friend Charlie (who is fighting the war in France) show off her humorous side. Uncle Holt even shares her letters with a local newspaper where they print her unique insights and experiences. The rest of the story is almost unbelievable, but becomes remarkable because of her resourcefulness, hard work, stubbornness, kindness and integrity. It is hard to believe that a young girl should ever have that kind of pressure, but through it all she becomes stronger and she finally finds a family. The title doesn’t do this book any favors, but the story is a great one and I look forward to reading the sequel, Hattie Ever After, coming out February 12, 2013. Since Diane posted about one of her favorite Kevin Henkes books yesterday, I thought I would share my favorite today. Let me start by saying, Kevin Henkes is a genius. I've never met him, but I have proof: Kitten's First Full Moon, Chrysanthemum, Little White Rabbit, My Garden, Lilly's Purple Plastic Purse, Penny and Her Doll. Genius. But, of all his books, my favorite is Owen. Owen has a fuzzy yellow blanket that he takes everywhere with him until his nosy neighbor, Mrs. Tweezers, interferes. She thinks he is "getting a little old be carrying that thing around," and so, on her advice, Owen's parents try to get him to give the fuzzy yellow blanket up. After several failed attempts -- the blanket fairy, the vinegar trick, saying "no" -- his mother comes up with a solution that makes everyone happy. Henkes uses single and multi-panel illustrations to show action and to capture Owen's personality, creating a perfectly-paced story. Family dynamics are spot-on, both in the text and the pictures. Owen is at the center of the story with the adults seen from his point-of-view. His parents are clearly on his side as seen in the hint of worry on his mother's face when she has to say, "no" and the look of horror from his dad as Owen's mother cuts the blanket. Even Mrs. Tweezers, seen peeking around and whispering over the fence, is redeemed when at the end of the story, Owen happily waves to her, letting the reader know that all is well. 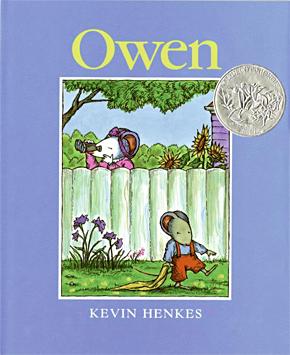 Owen was a Caldecott Honor book as well as a Boston Globe-Horn Book Honor book. For my early childhood education class, we had to pick our favorite children's picture book and read it to the class. So, in order to pick the perfect book, I found myself re-reading some of my favorites. After much debate, and some shed tears, I finally settled on this book. Now, I don't actually know if it is my favorite book, but it sure is cute, and it's fun to read aloud. 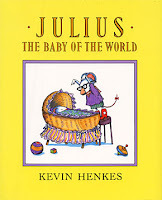 Julius the Baby of the World is another one of the cute books that Kevin Henkes wrote and illustrated. Lily has a new baby brother, and like all little girls, she is jealous. "'I am the queen,' said Lily. 'And I hate Julius.'" And during the book, she is not very nice to Julius. "'Julius was really a germ. Julius was like dust under your bed. If he was a number, he would be zero. If he was a food, he would be a raisin. Zero is nothing. A raisin tastes like dirt.'" But her parents still try to make amends with Lily by giving her extra privileges, but Lily will not be persuaded. That is, until Cousin Garland shows up, and says the same things that Lily was saying about her brother. But Lily was not ok with this coming out of someone else's mouth. And she soon set Cousin Garland to rights. The story ends with, "Julius is the baby of the world. And from then on, he was. In everyone's opinion. Especially in Lily's." Kevin Henkes does a great job of having a little kid's mindset. And the pictures add a lot to the story. All of Kevin Henkes' books are amazing, and I love to read, and reread them again and again. I also really love Lily, and I have read most of--if not all of her books. Lily is constantly making me laugh with her funny quirks and her very childlike ways of thinking and doing things. I read I Want My Hat Back by Jon Klassen to my first-grader's class today. I fell in love with this book last year -- actually, a whole lot of people did (except for the ones who hated it) -- and my kids thought it was the funniest book of the year, but I was a little nervous to read it to the first-graders because I wasn't sure how they would react. I needn't have worried. Bear's hat is missing, so he asks each animal he encounters if they have seen it. Instead of using "bear said" or "he said" to show who is speaking, dialogue is colored -- black for the bear, brown for the fox, green for the frog, red for the rabbit, and so forth. 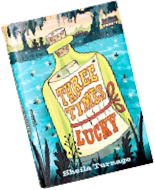 As a read-aloud, this book needs different voices to distinguish the characters, but that also makes it really entertaining for kids. After bear has asked several animals if they know where his hat is, he realizes (with the help of deer) that he actually DOES know where it is. And that's where the funny part comes in. I love books that are funny without having to hit kids over the head with the joke. This books lets readers (or listeners) discover the joke on their own, making it that much funnier. Digital and ink illustrations with plenty of white space keep the focus the characters. Klassen does an amazing job of expressing emotion with subtle differences to the eyes. The bear generally keeps a deadpan stare, but a little widening of his eyes show the realization that he knows where his hat is. Then the eyes narrow as determination to get it back sets in. I Want My Hat Back won the E.B White Read-Aloud Award for Picture Books last year and was a Geisel Award Honor book. When I turned to the final page in the book today, the first-graders had a range of reactions: some quietly gasped, others giggled, and (SPOILER ALERT) one boy burst out, "He ATE the rabbit!" When my son came home from school a couple of weeks ago and told me that he needed a book to give to his class for his birthday, I had no idea the anxiety that would go into deciding which book to give. A birthday book, apparently, has to be the perfect book -- something the entire class will not just enjoy, but will adore. So I made suggestions, we looked through our shelves, and after many false starts, he finally found a book to give to his class -- Papagayo by Gerald McDermott. Papagayo the parrot is noisy and mischievous He disturbs the night creatures who sleep during the day with all his squawking. When the "ghost of an ancient monster dog" awakens "beneath the stones of the Great Ruined City," the night creatures are too frightened to stop him from devouring the moon. Just as things seem hopeless, Papagayo helps his friends find the courage they need to stop the moon-dog. McDermott's tale is flavored with rich vocabulary: the parrot's noise is "raucous"; the creatures "venture forth"; the moon-dog "scurrie[s] across the starry fields of the sky." The vivid pencil and gouache paintings set on white backgrounds show the parrot in eye-popping color during the daytime. Blue backgrounds for the night scenes subdue the color slightly, while still showing all the glorious variety of the rain forest. And the moon-dog is just the right amount of scary (which is what finally helped my son come to a decision). The book must have been a success because the day after his birthday my son jumped in the car and said, "They wanted to read it again!" Step Gently Out is another of my favorite books from 2012. This poem by Helen Frost invites readers to "Step gently out, be still, and watch a single blade of grass." It asks you to look at the little things: an ant, a honeybee, a moth, and a spider. And as you contemplate those little things, breathtaking photography by Rick Lieder grabs your attention. A pink and yellow moth, a spider dropping from a web highlighted with droplets of dew, and a brightly patterned yellow jacket all take on a quiet importance in full-bleed photos that bring nature up-close. Everything about this book works in harmony, from a perfectly-chosen font to end papers that feel like the beginning and ending of day. Even the dark green metallic lettering on the pale green spine is beautiful. More information about each of the insect featured is included at the end. 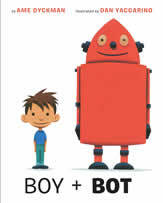 Boy + Bot by Ame Dyckman is one of my kids' favorite picture books from this year. I think that its popularity at our house may have something to do with the corny voice I use for the robot, but really, when a character says things like, "Affirmative!" and "Did-you-malfunction?" his voice begs to be read in "robotspeak". When a boy and a robot meet, they become instant friends and spend the day playing outdoors until a rock bumps the robot's power switch and he shuts down. Concerned, the boy takes his new friend home and tries to help him. Another accidental bump turns the robot on in the middle of the night, but now the boy is asleep, so roles are reversed as the robot takes the boy home to fix him. All is put right in the end, and we see a joyful double-page spread filled with scenes of the two together. Dan Yaccarino's bright gouache paintings bring the robot to life, giving depth to the friendship. And I love the humor in the details: the boy sipping his soda, while the robot sips his oil; and the robot trying to oil the boy's ear. With short snappy sentences and only a handful of words per page, this energetic picture book can be enjoyed by early independent readers as well. I didn't get around to reading Can We Save the Tiger? last year when it was published, so I picked it up today. I thought it was going to be about . . . well, saving tigers, so I was surprised that tigers were not even mentioned until page 10. While author Martin Jenkins does discuss tigers, the book is actually a broader look at animal conservation. With an engaging text, Jenkins addresses extinct animals (dodos, Stellar's sea cows), endangered species (tigers, partula snails), and those that have recovered from the brink of extinction (American bison). He concludes with the efforts being made to protect endangered species. I had seen interiors shots of the book in reviews last year, but I didn't appreciate the artistry of the illustrations by Vicky White until I saw them full-size in the book. The predominately black-and-white pencil pictures capture the majesty of the animals, and where White uses oils to add color, the pictures glow. This is a great book, so if you missed it last year, read it today. I love this time of the year when everyone is compiling lists of their favorite books. Publisher's Weekly has announced their lists for 2012. 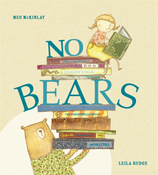 Today I read No Bears written by Meg McKinlay and illustrated by Leila Rudge. Ella, the narrator, is tired of bears, but she is in charge of this book, and so, there will be no bears in it. Instead, Ella wants pretty things, funny things, exciting things, and scary things in her book. She creates a book about a princess, a monster, and a fairy godmother and NO BEARS. But (mostly) outside the frame of her book, watching the story -- and participating in it -- is a bear. After reading this with my very literal-minded kindergartner, I asked, "Was there a bear?" She was quick to respond, "No, she said there were no bears." But my preschooler pointed out the bear in the book, and we looked back through the pages to get the real story. The stylized illustrations are playful, and even the monster isn't really scary. There are plenty of details to look at in Ella's book-within-a-book, including fairy-tale elements throughout (Red Riding Hood, a wolf, a gingerbread man), but the real fun is outside the main picture frames. Rudge bends frames, makes creative use of the gutter, and sends her characters off the pages. You have to stop and look at the illustrations to understand the story -- the key points being played out in the margins. But just in case you miss it, the bear wordlessly retells it on the last page. To celebrate Picture Book Month, I'll be reading a picture book every day in November, and if all goes according to plan, I'll post every day to let you know what I've read. Feel free to chime in with what you are reading and loving this month. 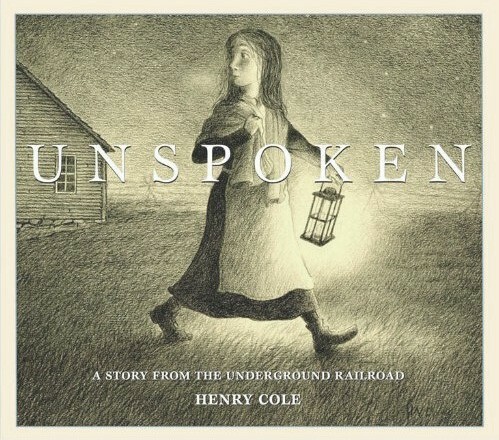 I start with Unspoken: A Story From the Underground Railroad by Henry Cole. This wordless book tells the story of a young girl's brief encounter with a runaway slave in beautiful pencil illustrations. (Some might quibble that you can't technically read a wordless book, but anyone who has watched a toddler read a book, knows better.) The frightened girl bravely sneaks out of her house to take food to the hiding fugitive. I especially liked the scene where slave hunters confront the adults in the house as the girls hide. A great story filled with tension, courage, and hope. You can read more about this and other books by Henry Cole at his website.